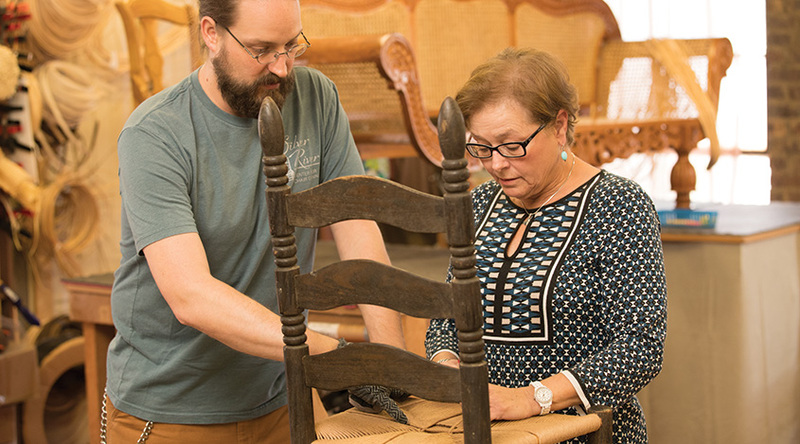 Self-professed “chair nerds” Brandy Clements and Dave Klingler are helping to resurrect the nearly lost art of chair caning. Among those proudly carrying this mantle of craftsmanship are Brandy Clements and Dave Klingler, the chair caning couple who opened the Silver River Center for Chair Caning in 2015 in Asheville’s River Arts District. These two serious “chair nerds,” as they like to say (they even have stickers touting the phrase), operate the only chair caning school and museum in the United States. They’ve truly built their lives around this niche craft, mixing Dave’s engineering background with the knowledge and experience that has been passed down to Brandy through four generations of chair caners. Yet the word “niche” doesn’t feel right when you consider the importance of chairs in our daily lives and the long history of chair making. As Dave explains, “People and chairs have a unique relationship. Chairs hold you; when people come visit, chairs facilitate conversation.” While this craft may be unfamiliar to many, modern-day caners have resurrected a skill that traces its lineage back to 1300 B.C. as a form of basketry. Now, Brandy and Dave help keep this art form alive through chair caning classes, their small but well-curated museum, “chair nerd” merchandise, and, of course, repairing broken chairs. The latter provides their largest stream of income, but it’s often the part of the business that gets brushed to the wayside first, since running a business, coordinating with and teaching their students, and talking with museum visitors often makes for a fragmented day. This ancient practice has long been a global trade, dating back to the 1600s when seat weaving materials were traded alongside spices and teas. In the 1700s, royalty sat upon tall, caned chairs, helping caned furniture gain steam as a global aesthetic, especially in warmer climates since the cane could withstand heat and humidity better than solid woods. In the next century, manufacturers churned out chairs and helped a seat weaving cottage industry thrive. As industrialization continued, however, the manufacturers turned to pressed caned seats, which didn’t require a human weaver but lacked the same quality or stamina. Today, many people think of wicker furniture and caned furniture as one and the same, although caned furniture refers specifically to woven seats and backs and not just any item made out of rattan stalk, a part of the palm family. Brandy lights up talking about these trips, and it’s apparent that for her, chairs are worth traveling the globe to see because they represent a piece of history and tell a part of that culture’s story, while allowing her to also share about caning with like-minded chair enthusiasts. This educational and historical advocacy wasn’t always part of the plan, Dave notes, saying, “In the very beginning, we were just going to do picture framing, then we opened Go Chair Repair.” Once their website launched in 2010, they were inundated with chairs, with eight being dropped off during the grand opening of their first studio, a smaller, windowless studio in another part of the River Arts District. As Go Chair Repair, for the first five years they were focused almost exclusively on restoration. The tale has also been spun into a chamber opera, and it serves as a guide for Brandy and Dave whenever it comes time to make a decision about the business as they strive toward loftier ambitions for Silver River. “I’ve tried to limit my committees and boards, but if you care, you over-give. I have to live by want-to versus have-to right now,” Brandy explains. Yet she stays active in the Southern Highland Craft Guild (“I thought it was going to be hoity-toity, but it’s so freaking helpful”) and has taken classes at A-B Tech to enhance her knowledge about running small business operations. Their renewed vision made it easier to say “no” to a potentially lucrative deal to buy out a retiring chair caning supplier, too. “We were so flattered, but the more we thought about it, with the customer service and logistics importing materials from India and China, the more we realized it didn’t align with our vision.” Neither regret passing up that deal. “We will never run out of chairs to work on. At one point, people were coming in from Connecticut and Hawaii!” Brandy exclaims, laughing. “I mean, we will never cane everyone’s chairs. Most of our colleagues are covered up as well. Before they opened Go Chair Repair, Brandy juggled being a yoga trainer, massage therapist, and waitress, but that all changed when she became an Artist in Residence at Grove Arcade Arts and Heritage Gallery in the fall of 2008. For Dave, after finishing his mechanical engineering degree, he had no interest in getting a “real job.” Instead, he too took up a family trade and started a woodworking/home repair/landscaping business with his brother. He felt like a kid again, hammering away in his grandfather’s shop when he was a boy. Eventually, the two would meet in Folly Beach, South Carolina, at a point in time when both seemed to be looking for a change and a way to spend their days working with their hands. Brandy steered the pair toward Asheville, which she had fallen in love with during college summers teaching at the Falling Creek Camp for Boys in nearby Tuxedo, and they’ve felt at home here ever since. High on Brandy’s list is to transition the business into a nonprofit. “The more I talk to these nonprofits like Lowell’s Boat Shop and museum, the oldest continuously running boat shop in America—well, it’s not a static museum,” she explains. “And (master woodworker) Peter Korn wrote a book in Maine and started out making furniture, teaching it, opened a school [the Center for Furniture Craftsmanship, in Rockport, Maine], then it turned into a nonprofit. It’s important to establish yourself as an expert in the field first. These people have been really helpful as we work to become a nonprofit.” They hope that becoming one will help ease the financial burdens of running a business, when really, they want to be running a museum and educational center and then only caning when they want to versus have to. “Some days, you just want the shop to yourself and to just cane all day,” Dave says, and Brandy vigorously shakes her head in agreement. The day I visited, they easily had 50 chairs in the back waiting to be caned for customers, and their current wait times are up to two months. “We will never run out of chairs to work on. At one point, people were coming in from Connecticut and Hawaii!” Brandy exclaims, laughing. “I mean, we will never cane everyone’s chairs. Most of our colleagues are covered up as well. The more we realized people’s reactions, the more we realized we don’t need to hog all the chairs. We can let business walk out the door. We used to begrudgingly work on some chairs, and now let some walk out the door since we can do some of the more complicated chairs.” To help reduce their workload a bit, they hired a part-time employee last year and also have an intern. A fellow chair nerd from Raleigh also drives over about once a month to cover the shop for them. It’s evident that they enjoy tackling older and rarer chairs, with Brandy mentioning wistfully she’d never gotten the chance to work on a particular style of chair. So, taking the nonprofit approach seems to make a lot of sense for their five-year plan, since it will free up time and energy to focus on quality over quantity as well as aid their goals to grow the craft. “We had a group of middle school kids come in from United Way, and to show them what we do, we brought out a bunch of hats and explained all our roles that way. By the end, we were wearing 15 different hats, and they got a kick out of us trying to balance them all on our head,” Dave says. “Trying to juggle everything while also producing the work we need to make money is…” he trails off. “A lot?” I offer, and he grins and nods his head in agreement. Earlier on, they tried working with museums and installations, but in those situations, Brandy said, “We’re often treated like ‘the help.’” This bias shows up in the way museums typically display chairs, too. For example, most places only credit the chairmaker and rarely mention chair caners, except at Yale University. They do have a partnership making woven seats for local chairmaker Brian Boggs to provide another stream of income. (Boggs was profiled in the June 2015 issue of this magazine.) But what really drives them is a shared vision to one day fill up a 10,000-sq.-ft. space with a distinct museum, workshop, and store sections to help ramp up educational opportunities and showcase a robust timeline of the history of chair caning. Of course, a building like that doesn’t run cheap. Brandy mentions some of the nonprofits she’s been reaching out to, explaining that some get $300,000 in funding a year while others may get $1 million or more. They’ve been working with a mentor from SCORE who’s guiding them on what documentation needs gathered and advising the couple on paving the way to become a nonprofit, like getting published, public speaking, and being a visible advocate for caning. Brandy appears to be relishing this role and shares that during a recent trip to drop off chairs in Winston-Salem, an unofficial group of 21 fellow chair nerds asked her if she’d give a short talk about caning. She spoke for over two hours. Often people who walk through the door are greeted by their sweet pooch, Rosie, and the vibe is industrial-meets-historical inside their working studio, museum, and chair shop that’s part of the Curve Studios in the River Arts District. Anyone who visits the shop will surely notice the commitment they have to their work, which for Brandy stems from being the fourth generation caner in her family. “We want to make it a chair caners’ mecca. From the get-go, that was part of the long-term goal,” Dave explains. “But opening a second location on the West Coast would be ideal, too,” Brandy adds. It’s easy to envision young Brandy responding with the same kind of vigor when her family first introduced her to caning. When I ask what they do for fun, they both sort of shrug their shoulders and give a clipped answer, “Beer, music, you know.” These chair nerds are all in, with seemingly little time spent outside the realm of their craft. Their advocacy has begun paying dividends, including Brandy being accepted to teach chair caning at the John C. Campbell Folk School in Brasstown, North Carolina, in 2018. This nonprofit started in 1925 and offers a wide range of classes from expert craftsmen year-round leading intensive weekend and week-long learning experiences. Forty-nine subjects are listed in their directory, including blacksmithing, beekeeping, and tinsmithing. And in 2016, Silver River hosted the Seatweavers’ Guild’s 9th annual gathering at the Folk Art Center, with hopes of hosting an annual conference here in Asheville at some point. The easy back-and-forth, flowing from work to conversation and back, shows this balance in action. As Brandy and Dave continue their mission to make Asheville synonymous with chair caning, they know one thing will be key to making their marriage and their growing business work. “You have to make time for yourself,” Brandy advises. Sounds like a day of peaceful chair caning solo is in order. Although Silver River Center for Chair Caning is the nation’s only chair caning school and museum, here’s where you can find other chair caning classes and exhibits.